Carter Quilt Bedding by VHC Brands | P.C. Fallon Co.
Hooray for the red, white and navy blue! A fresh Americana look in a mix of plaids and a solid navy slub-weave fabric and accented with white pick-stitching, Carter has an easy and wide appeal. 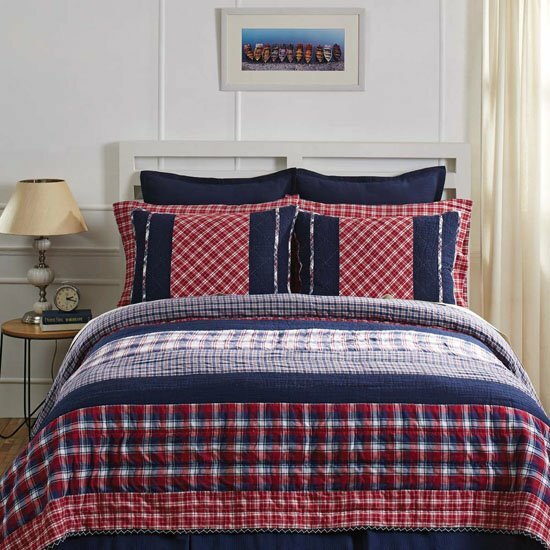 Quilt features horizontal channel hand-quilting detail on stripes of cherry red, navy, and snow white plaid. Carter is an ideal choice for many décor styles including lake house, beach house, Americana, updated farmhouse, rustic, patriotic, and updated country. Available pieces include quilts, pillow cases, standard shams, and luxury shams. Machine pieced and hand-quilted. 100% cotton. Imported. Machine wash in cold water on gentle cycle.